If the Democrats had chosen to divide Governor Rauner’s introduced budget by 12, at the projected revenue estimate of $32 billion, the Governor would be willing to sign a one-month budget. HB 4190 clearly did not contain one-month spending levels, and as such, was defeated on a partisan roll call of 67-01-32 (71 votes required). However, Senate Democrats were able to narrowly pass a similarly unbalanced one-month budget over to the House. SB 2040 has been assigned to the House Executive Committee. · Governor Rauner vetoes pay hike for legislators. Current State law grants automatic cost-of-living adjustments (COLA) to members of the Illinois House and Senate, as well as elected statewide officials. In FY16, this law was scheduled to grant pay hikes to lawmakers for $1,356 to $1,905, in addition to their existing salaries and stipends. On Wednesday, July 1, Gov. Bruce Rauner used his amendatory veto power to strike out the automatic COLA increase for elected State officials and lawmakers. The veto also freezes he lawmakers’ “per diem” daily expense money and travel mileage. The Governor’s action on SB 1354 will be effective through June 30, 2016, unless overridden by the General Assembly. · House Republicans lead effort to stop legislative pay raises. After defeating the Democrat majority’s unbalanced temporary budget, House Republicans took to the floor Wednesday in an effort to stop the automatic legislative pay raises from being enacted. House Republicans are pushing for passage of HB 4225 to do just that. Our legislation specifically prohibits cost-of-living adjustments for members of the General Assembly and other elected state office holders in the new fiscal year. · Illinois property taxes among highest in U.S. Existing laws to limit Illinois property taxes, including statutory caps on rates and a partial freeze on property tax extensions, have not been successful in halting these increases. The complex law that partly freezes property tax extensions is disliked by many taxpayers because of the many loopholes that have been carved into the law. Home rule units such as Cook County and the city of Chicago are completely exempt from the extension freeze, and non-home-rule units such as school districts are able to ask for, and get, annual increases (tied to inflation) in their “frozen” extensions. A bipartisan group of lawmakers, led by Republicans and Governor Rauner, are fighting to implement a key plank of our 2014 election mandate. By completely freezing Illinois property tax extensions (no exceptions) for two years, Illinois can grant relief to our taxpayers. The same two-year period will create a window of opportunity, with a deadline, to carry out real discussions to change our school funding formula and look seriously at the way we fund public schools. · New Bannockburn, IL-based global business firm. On Wednesday, July 1, the Deerfield-based Baxter International spun off a major unit as a freestanding firm. Baxalta, Inc. contains the former units of Baxter International that manufacture biopharmaceuticals for chronic conditions such as hemophilia and immunodeficiency. The new global-reach biopharmaceutical company, which will be publicly traded on equity markets, starts from a base of $6 billion in annual revenues. It has established its headquarters in Bannockburn, north of Chicago. · Waters rise throughout downstate Illinois. Heavy early-summer rains have worsened floodwater conditions through much of the state. High water and overtaxed farm field drains have also led to crop damage and diminished future harvest yields of corn, soybeans, and other Illinois crops. State climatologist Jim Angel, after measuring rain gauges sited throughout Illinois, reported on Monday, June 29 that this recently-concluded month was the wettest June in Illinois history, with 8.91 inches of rain falling. Conditions are especially challenging along the Illinois River, which collects runoff from countless smaller rivers and streams. The river was running about 10 feet above flood stage as the week began. Parks and other bottomland parcels are inundated, disrupting plans of Illinoisans and visitors to Illinois for boating, fishing, nature walks and camping. Riverfront towns are facing increasingly severe pictures of actual and potential property damage, and sandbag work has begun. The Illinois Emergency Management Agency, which coordinates the State’s disaster mitigation efforts, is cooperating with the Department of Corrections to assign State work camp inmates to help fill and place the sandbags. · U.S. Supreme Court decision offers hope for honest political maps in Illinois. Since the Illinois Constitution was adopted in 1970, state lawmakers have presented themselves to the voters within legislative districts drawn by a partisan process controlled by one political party. Since 2001, the Democrats’ control over drawing the legislative maps has been extremely valuable for them, and increasing use of computer software to draw these key boundaries has meant this advantage has grown over time. In the November 2014 election, the voters of Illinois voted a Republican, Bruce Rauner, into the governor’s office by a wide margin – but the same voters found that after they had cast their votes within these artificially drawn districts, they had elected supermajorities of Democrats to both the Illinois House and the Illinois Senate. A growing number of Illinois political observers, in both parties, are pushing to move this key mapmaking function out of the hands of partisan politicians and into the control of a politically independent redistricting commission. Similar commissions have successfully reduced the role of mapmaker-politicians in states such as Arizona and California. On Monday, June 29, the U.S. Supreme Court issued a decision upholding the constitutionality of the independent redistricting process when drawing maps for elections to Congress. The high court’s verdict opens the door to a renewed push to create fair maps in Illinois. The Chicago Tribune published an editorial this week in favor of the proposed Illinois Independent Map Amendment, an amendment to the state Constitution that would change the way we draw maps for districts and members of the Illinois General Assembly. The current mapmaking process has played a key role in maintaining the influence of Speaker Michael J. Madigan, who was first elected to the Illinois State House’s highest chair in January 1983. Thirty-two years later, he is still there – the highest-seniority state legislative political boss in American history. · Governor Rauner’s office announces tentative labor agreement with Teamsters Union Local 700. The agreement, which is subject to ratification, covers nearly 350 workers at the Illinois Department of Transportation and other State agencies. Many of the personnel covered by this agreement drive heavy equipment and help maintain highways and other public infrastructure. With the State’s budget crisis looming over the talks, agreements had to be reached on many key negotiating points. The agreement includes a four-year wage freeze, a reduction in the payout for accumulated unused vacation time, and maintenance of health benefits. The agreement is reported to contain innovative language creating a new performance incentive program to reward covered employees for improved productivity. Incentive triggers will include cost-saving work rule changes, and bonuses for meeting or exceeding performance metrics. The agreement, reached on Wednesday, July 1, will cover a four year period if it is ratified. Negotiations continue with other public-sector unions and with other locals of the Teamsters Union. · State continues path toward implementation of law; petition window opens to add additional qualifying conditions. The Department of Public Health, which is directed by State statute to oversee the new medical cannabis law, issued another report this week on its pathway toward implementation. As of June 30, approximately 2,600 patients throughout Illinois have passed through the application and clearance procedures and have received approval letters allowing them to participate in the closely guarded program. Another 20,000 patients have commenced the application process. Implementation is slow. Numerous legal barriers, such as the need to finalize legal permission to open dispensaries and handle the funds to be generated by the program, continue to delay the actual sale of cannabis to qualified patients in Illinois. To be qualified, patients must have an approved medical condition such as multiple sclerosis, ALS, or cancer. Qualified patients, who must get permission from their M.D. caregivers to apply, pay an annual fee of $100. When cultivation centers and dispensaries go into operation, qualified patients will be authorized to enter the dispensaries and purchase small quantities of cannabis for self-treatment of their medical conditions. Some patients have debilitating medical conditions, such as treatment-resistant anxiety, that are not on the list of diagnoses that qualify the patient for Illinois medical cannabis certification. A new window of opportunity has opened during July 2015, ending July 31, to submit a petition to DPH to add additional diagnoses to the list of qualifying diagnoses. The petition must be submitted by paper mail. Petitions are looked at by the Medical Cannabis Advisory Board within DPH, which includes medical doctors and registered patients. Even if DPH accepts the petition, that does not mean that the Department will accept the addition of the requested diagnosis to the list of approved diagnoses. · Severance reform will save money for Illinois taxpayers. A bill addressing runaway severance agreements funded with taxpayer money has received an overwhelming stamp of approval from both chambers, passing out of the Senate unanimously on Wednesday. House Bill 303, sponsored by Rep. Margo McDermed, bans efforts by public entities in Illinois to hide severance agreements from scrutiny by the public. Allowing taxpayers to obtain severance agreements under the Freedom of Information Act was formerly championed by retired Rep. Renee Kosel in response to an egregious severance payment of $700,000 to former Metra CEO Alex Clifford. Kosel’s bill died in the Senate. Representative McDermed picked up the torch and the initiative received new life when it came to light that a $763,000 severance agreement was provided to outgoing President Robert Breuder at the embattled College of DuPage. · Rep. John Anthony reports to House on Coal City tornado. Volunteer public safety officers responded to the Monday, June 22 twister, which brought winds of up to 160 miles per hour to Coal City-Braidwood. The tornado was classified as an EF-3 funnel storm, the third highest ranking for tornadoes. Property damage was extensive and five persons received hospital care for injuries, but fortunately, no one was killed. 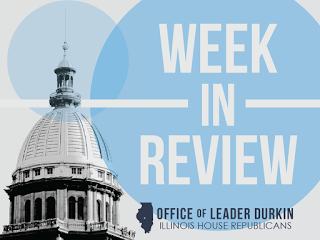 Rep. Anthony joined the rescue and response crews and reported back to the Illinois House this week. Further squads of volunteers from throughout Northern Illinois, including the Chicago area, have returned to continue the cleanup effort. As with ongoing Illinois floodwater conditions, the response is coordinated by the Illinois Emergency Management Agency (IEMA). · Illinois has begun issuing driver’s licenses with veteran’s status. The new cards, announced this week by the Secretary of State, will be voluntary for all veterans who have received an honorable discharge. This includes all DD-214-carrying certified completers of U.S. military service. Qualified veterans are invited, but not required, to work with the Illinois Department of Veterans Affairs to obtain a certified copy of their DD-214. Then, the veteran is invited to present the certified discharge paper at any office of the Secretary of State’s Office of Driver Services when he or she is applying for a new or renewed Illinois driver’s license or State ID card. The newly-printed card will display the driver or resident’s status as a service veteran. The revised card format became effective on Wednesday, July 1. · Rep. Joe Sosnowski leads celebration of state flag centennial. The first version of the familiar white banner was adopted in 1915. Through the 1800s, Illinois and other states had informally adopted a variety of colors that were physically carried by each regiment in battle. Many of Illinois’ and other states’ Civil War flags became famous. At the beginning of the 20th century, however, changes in military technology were making regimental flags obsolete. The Daughters of the American Revolution (DAR) led a nationwide campaign to get all of the 48 states that were part of the Union at that time to adopt separate, unique State flags. Here in the Prairie State, the Illinois DAR chapter sponsored a statewide contest for a proposed new flag design. Lucy Derwent of the Rockford DAR designed a white banner charged with the Great Seal of Illinois. The Illinois General Assembly agreed, and a law creating the new flag became law on July 6, 1915. This weekend thus mark’s our State flag’s 100th birthday. The 1915 law did not specify some of the elements of the flag’s design with the precision required by practitioners of “vexillology” (flag design). A major amendment to the Flag Act, adopted in 1970, codified the components of the flag design and created a precise template for Illinois flag weaving and manufacture. The amended Flag Act generated the flag that we know today. The flag’s centennial was celebrated on Tuesday, June 30 by HR 596, sponsored by Rep. Joe Sosnowski, who represents much of the Northern Illinois grounds around Rockford that was the home of flag designer Lucy Derwent in 1915. · Get the Week in Review emailed directly to your inbox! Sign up today to get a first-hand look at the continuing legislative and fiscal challenges facing policymakers in Springfield.